Happy Friday to you all from the hot, but beautiful Adirondack mountains in upstate New York! It looks like we have totally skipped right from winter to summer, with temps in the 80’s over the past two days! I wont complain though because at least it’s not twenty below zero and we are able to go out amd about. At week number five, my Callas are nineteen and a half inches at their tallest peak, and there are now three d7stinct flowers with a couple more on the way! 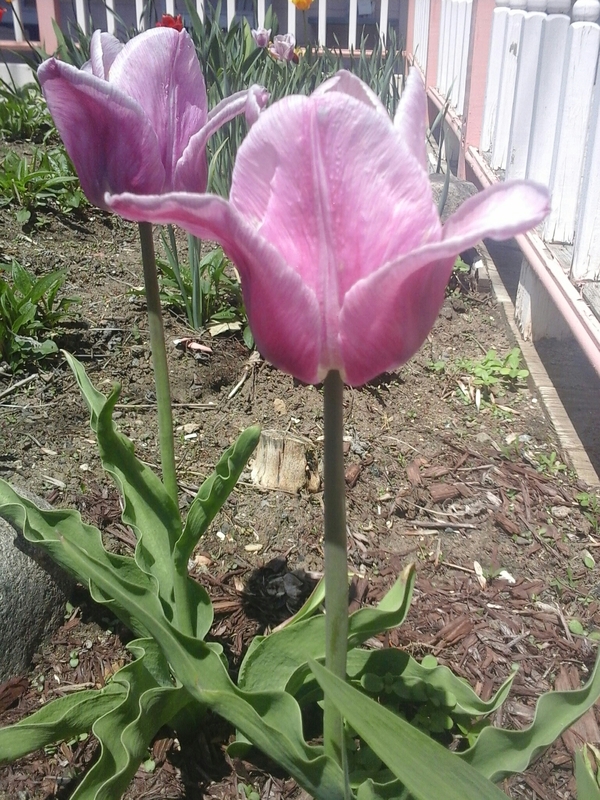 The first flower to bloom is the one on the left and it still looks just as beautiful and vibrant as day one! It’s Memorial Day weekend here in America, that we honor ours lost in battles. Take the time to thank a vet, and to take a moment to remember those who paod the ultimate sacrifice. Memorial Day is not just about barbecues and beers! Top o’ the Sunday morn’ to ya’ll! It is cloudy and forecasted to thunderstorm here in the great Adk’s of the USA! I am hoping for a good storm, one with thunder that cracks so loud noises t makes you jump out of your seat! 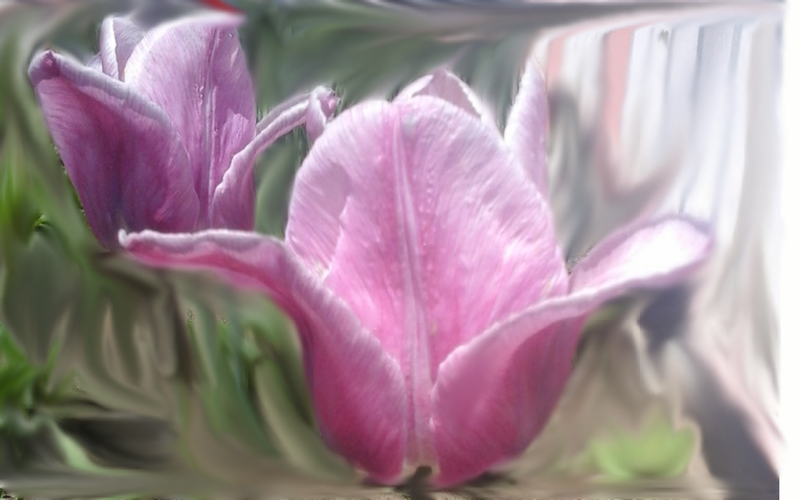 As you can see, I cropped and then took the paint brush to it to smudge the background to bring the tulips fro t and center to get the commanded appreciation that they deserve! See my photo of the day here and cast a vote! Since I haven’t posted a recipe in some time, I thought today would be a perfect day to do my first ever critique about a product. I have had my eyes on various Bob’s Red Mill products lately, curious to try the veggie soup mix. I picked some up a couple days ago at my local grocery store. …and added it to 8 cups of water, as per the instructions (4 cups of water per 1 cup of mix) and brought to a simmer. Now this is where I went wrong, not cooking the mix long enough. The instructions on the package suggest 30-50 minutes and while I cooked closer to the 30 minutes, I recommend cooking closer to the 50 minutes, so that some of the peas don’t come out crunchy like mine did today. Let’s do a brief run-down of how thrifty this meal was to make. I used about half of the soup mix, so we’ll call that $2.50. Add $1 each for the can of tomatoes and the can of beans, and then 50 cents for the half a pound of macaroni. All together, that is about $5 for the cost of the whole pot of soup, which easily has 6-10 bowls of soup in it, depending on one’s appetite. It is a common misconception that eating a plant-based, cruelty free diet is expensive. I don’t know about any of you all, but I think $5 to make a whole pot of delicious, nutrient dense soup is worth every cruelty-free penny! Speaking of healthy, this soup is packed with iron, 18 grams of protein combined per serving of the soup mix and macaroni, and 20% iron, not to mention the plethora of b-vitamins, antioxidents, and additional protein and iron of the tomatoes and the beans added. Next time you are looking to make an easy soup that you can doctor up with your own veggie goodies, pick up a bag of Bob’s Red Mill Vegi Soup Mix, and see what soup delight you can concoct! Growing FASTER than a Weed! To say that my Calla Lilies are growing like a weed would be the understatement of the week, literally! The pic on the left was taken just last week, only two weeks into growing, when the Callas were a mere 5″ tall. The pic on the left (and below to enjoy it in an expanded view) was taken this morning. Calla Lily Week 3: New Flower Forming? The Callas measured in at 12 1/4″ this morning, more than DOUBLE their height in a week! Over the past couple days I have noticed some coloration, like maybe a flower starting to bloom, though I would doubt that being that they have only been growing for just over three weeks. This morning when I woke and checked my email, I opened an email that will forever change my life: I got my first pay as a freelance writer for the online company, Zemandi! It has been slow going, getting going, but now that the ball is rolling, I’m well enough on my way to earn some bill money while I stay at home to take care of Baby Girl. I was leary to try Zemandi at first, as there are a LOT of scammers out there! I took to Craigslist for some of my job search and there was a LOT of nonsense and spam to sift through. One site for writers sounded very promising, until I clicked on the “sign up” tab and they wanted $68 for membership! That wasn’t even for writing gigs, that was just a reference to sites that you could apply do, not even guaranteed work! Since it was free, I decided to give Zemandi a try. What would I have to lose except the time that I might have gotten scammed out of for my writing? I couldn’t really find many reviews out there about it, except for disgruntled people looking to make a quick buck. If you are looking for a quick buck, writing is NOT the way to go! Once you do the initial trial pieces (you get paid for them), Zemandi evaluates your performance, and if they like your work, they keep you on! You request and do assignments at your own convenience, which is why it is ideal for a stay at home parent like myself. Not only do I get to stay at home to work, I am less the stressed over worrying about daycare and transportation to get back and forth to work. I can literally wake up in the morning, make my coffee, and sit down for a little while and write. When Baby Girl naps, I take advantage of the quiet, and I write. When she goes to bed at night and I have the quiet time for the evening, I write. The pay is meager at first, but to have the convenience to be my own boss, and make some money doing what I love is a trade I am willing to make. Oh ya, and, I got a new plant, the beautiful Ginger Mint above. I picked it out for a Mother’s Day present and I love it! I love how it smells and the variegated leaves make it such an attractive plant to have indoors. Best part is, I can make tea from the leaves. I haven’t yet, but when I do, I shall write about it! Happy Friday all! I’m just killing some time with a blog post until I get more writing assignments (more on my freelancing efforts to be discussed in a future post!) 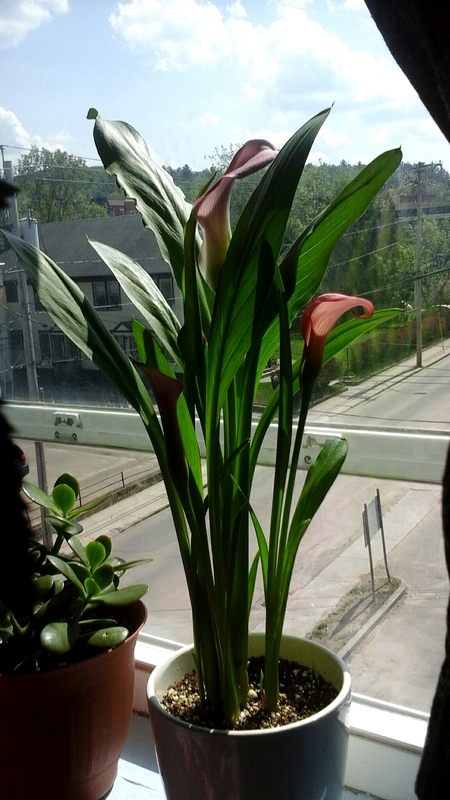 and thought I’d write a little update on my Calla Lilies. The first pic was taken this morning, just two short weeks after sprouting (shown in the second pic) and I just cannot believe how quickly they are growing. The stalks are already five inches tall, and there are a couple more little sproutlings growing as well. I read that Calla Lilies are slow to grow and bloom, taking up to two years to mature and bloom. At the rate these Callas are going, I couldn’t imagine them taking that long to bloom, but we shall see. A year ago, if you had told me that I would have 15 plants in my living room, I would have thought that a crazy notion, being that I’ve never had a green thumb. To be frank, I never really TRIED to be a green thumb. Sure, I loved plants, but I was happier watching others grow them. Then last September while visiting my parents in Connecticut, my mom gave me a clipping that she had grown from her Ivy plant. I was so excited to have just that one plant, because it meant a lot to me that my mom thought of me enough to start me a plant. My mom warned me that gardening is addictive and I laughed. I though, “ha ha, not ME, not THIS girl who has barely ever had a plant in her life!” Then winter happened, and I got caught up in the excitement of watching my Ivy grow, and I needed more. The more I was trapped inside and suffering cabin fever, the more I wanted plants to liven up my living room to ease the winter blues, if even for a little. Happy Thursday to all! I have been busy this week working on some freelancing work and have not had much time to blog. I planned to blog today and was not sure what about…and then, I woke this morning and saw these cute little sproutlings! Last week at Aldi’s I picked up a couple of these Crayola Coleus grow kits, on sale for only $1.99! There were only two left, and, being the thrifty plant addict that I’ve become over the winter, I snagged them! I thought it would be a fun little project to help pass the time, and better yet, decorate my living room with! Coleus is a colorful foliage that generally is treated as an annual, though pinching off the flowers to prevent seeds will prolong it’s growing cycle. Since I have two, I am going to let one grow it’s cycle naturally and attempt to harvest the seeds to grow more, and the other, I am going to prevent from seeding, to see how that grows. Coleus can also be propagated from a soft wood cutting, which I plan to do with my plant that I am going to just let grow. These were very easy for me to start, requiring little care. All you need to be careful of when sowing, is to keep the seedlings moist and keep the pot covered with saran wrap or something clear of the like, (I used an empty glass jar to cover the top) and keep them in bright light, but not direct sun. We’ve got sproutlings already, about a week and a half after sowing the seeds. If you have a little one, I would recommend finding them a little kit like this that they can sow their own seeds, and watch the beauty and miracle of plant life as they grow! As I wrote about the other day, I am working on some mini roses that will be donated to a memorial garden. Today, I picked up the beautiful bi-colored roses above, because truthfully, they had caught my eye the other day when I picked up the purple roses. My garden is complete…for now! I finally have the roses that I have been yearning for all winter. I have my own roses to keep, and that makes me a very happy plant mama. The two colors compliment each other well, and maybe, but some stroke of extreme nature, they will hybrid themselves. If not, I plan to try my hand at learning how to graft and propagate roses, once I am more experienced at gardening.